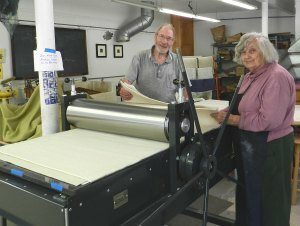 The Midcoast Printmakers, Inc. are inviting everyone to come and view the new Conrad Printing Press on Sunday, September 30, from 1 to 3 PM at the studio on the Round Top/DRA campus on Bus. Rt. 1 in Damariscotta. It was delivered and installed the end of August from the Conrad Machine Co. in Whitehall, Michigan. A generous donation from the NLT Foundation and other individual donors made it possible to add another press to the two presses already in use. The electric press has been converted into a lithography press from an etching press. The new press will accommodate larger prints up to 30 x 50 inches while the smaller press is still in use for prints under 15 inches wide. Thanks go to Hammond Lumber Co. that provided a forklift to move the crate to the studio where Gordon Clark’s I Haul business in Newcastle installed it in the studio. Contact Kay Miller at midcoastprintmakersinc@gmail.com for more information on the many classes offered.